all the clients you can handle! I know you have a mission. You are meant to help people, right? It’s your passion—your purpose in life! So why aren’t you doing it exactly the way you want to? If you’re like so many entrepreneurs, it may be because you are struggling with your marketing. You feel frustrated because as much as you LOVE what you do and are driven to help others, you can’t seem to find the right words to explain exactly what it is that you do, in an impactful way. If only your words could really reflect your ability to make a difference! You have studied marketing courses, chosen a niche, and are doing everything the “experts” tell you… but you’re still not landing clients. You have given presentations, written articles, and/or even run booths… but you still don’t land enough clients. You have gone to all the networking events, handed out dozens of business cards and talked to tons of people… but you’re not finding the clients you really want to work with? You wonder: where can I find them and what do I need to do to get them to work with me? Worst of all, the clients you DO get you can’t stand working with. Every time the phone rings and you know it’s them, you get the sick feeling in the pit of your stomach. But it’s even worse than that—some of them are so unhappy with you that you know they’re complaining about you to other people…or they’ve even asked for refunds AFTER you’re turned yourself inside out to make them happy! You are MORE than ready for your business to be successful. You’re just not exactly sure what’s wrong! You’re not doing anything “wrong”. The problem is that most marketing courses don’t teach you the number one, most important, most vital element of ALL your marketing efforts. The foundation. By now you may be wondering: So, Kim, what IS the number one, most important, most vital element to ALL my marketing efforts? You have to get crystal clear in your own mind as to who you are, what service you provide, how you impact your clients, and even more importantly, who your ideal client really is. Your Ideal Client is not a “niche”; rather, this is much more specific. That’s why choosing a niche without identifying your Ideal Client can lead to compromising your mission and a lot of wasted time, effort and money. Here’s the great news: I can lead you through the steps you must take in order to laser-focus your marketing… so that it not only works for you, but it works effectively. You CAN work less, make more, and have a bigger impact on the world! See, I’ve been in this business for a long time, and it grieves me to see all the money people spend on the strategic side of marketing (what I call “the doing”): learning techniques, processes and steps—only to be permanently stalled when they can’t answer the big questions: “Who am I marketing to and why would they want to work with me versus a competitor?” Once this occurs, these wonderful people lose their ability to move forward. All their investments begin collecting dust while the guilt of making those purchases eats away at their self-confidence. And that’s exactly why I created the Cash Through Clarity™ Training and Coaching Program. Throughout this five-part teleclass training, I share the same methods with you that have worked for hundreds of my private clients over the last four years. I teach you to laser-focus your marketing, so it finally works for you! You won’t be bulldozed into picking a niche. Choosing a niche before you’ve fleshed out (and claimed) your Ideal Client can trap you into a vicious cycle of expending more and more effort for less and less reward. You won’t be taught a one-size-fits-all strategy to magically turn your marketing around. You see, I believe that everyone is unique and your business is as unique as you are. Your marketing should be in perfect alignment with your gifts! You won’t have to struggle through this alone. This is NOT just another cookie-cutter info product, this is a FULL implementation program COMPLETE with coaching so YOU get the personal attention and specific strategies to YOUR unique situation. Plus, you’re going to get full access to our private Facebook group (we call it Team Clarity), where you not only get an opportunity to share ideas, insights and inspirations with your fellow CTC participants, but you ALSO get consistent, ongoing coaching from Yours Truly and my Head Juicy Marketing Coach. Your business is different, so you should get the personalized help and support you need to make sure your marketing honors that difference AND gets you the results you’re looking for. Posts on Facebook, LinkedIn, Twitter, etc. Find your own authentic marketing voice instead of latching onto what someone else thinks ‘your market’ will like, or what will sell. Differentiate yourself from everyone else out there in your field. Build your confidence and conviction in the value of what you’re offering, and raise your fees! Earn what you are worth, and what your Ideal Clients will be more than happy to pay you. Simplify your marketing so you can focus precisely on where your Ideal Clients hang out—this will save you hours and hours, not to mention hundreds of dollars. And, if you still have any concerns after the training, you have the opportunity to ask any remaining questions you might have in our private coaching calls! You don’t have to let go of your dreams because you need more income. You CAN find your authentic message, and I can help you do it. Do you have Multiple Ideal Client Personality Disorder? Do you want to help everyone? Is your head spinning with all the different types of people or organizations you can help? Until you clearly choose a place to start, your success will be stalled. Follow our proprietary diagnoses formula and you will see more clearly than ever before – and your marketing will be more authentic – and therefore more effective than ever. You’ll hear me coaching my VIP Juicy Marketing Clients – what better way to introduce you to the complexity of this “Claim ‘Em” process? Listen in as I reveal several access points to diagnosing the puzzle of MICPD – from demographics, to products, to programs. Get concrete tools and words and messaging you can use right away within your marketing, in all areas (online and offline). In the end, you get clarity, clients, confidence and cash. 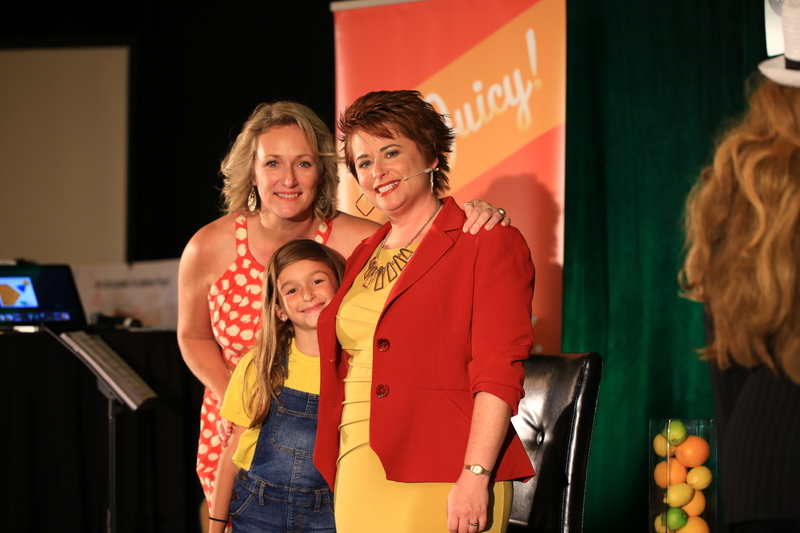 Tune Your Marketing To Your Ideal Client’s Frequency, So They Hear You & They Buy! Differentiate between Target Market, Niche, and Ideal Client—get this and you’ll be streets ahead of your competition! Build your Ideal Client Profile so you can tune into their frequency, use the words they want to hear, and know where to find them. You can’t find your ideal clients if you don’t know exactly who they are… so let’s find out! Finally, cure your Multiple Ideal Client Personality Disorder for good! Get down to the nitty gritty – who do you want to work with? Who do you NOT want to work with? And where to look to find your Ideal Clients? Get your answers, here. Master This Marketing SuperPower & Attract Your Ideal Clients Like Magic! Discover how to “get inside the head” of your Ideal Client, use their words, and inspire sign-ups. Create headlines that attract your Ideal Client by applying Headline Questions of Attraction. Create a quiz or assessment you can use on your business card, website and even when you’re networking—this is a marketing Super Power as good as being able to read minds! “Attract ‘Em” Maximizer: HEADLINE QUESTIONS OF ATTRACTION FORMULA PROCESS™ containing my proven methods for creating headlines and tles that grab your Ideal Clients’ attention and hold it, so you can put your juicy marketing magic to work. Confidently Express How You Help ‘Em So You Charge What You’re Worth! Distinguish your product or service for your Ideal Client Group. Determine the perfect Juicy Benefits that will attract your Ideal Clients. Find the courage and confidence to charge what you’re worth (and more). No more discounting your fees — you’ll be able to start charging what you want AND your ideal clients will be happy to pay it! Get “full of yourself” so people believe you can create the outcome for them! “Help ‘Em” Maximizer: THE WORDS TO GET PAID WHAT YOU’RE WORTH – The Juicy Benefits worksheet and guide will help you know exactly how to say the things that will attract your ideal clients by letting them know how you can help them, and exactly when and where to place your juicy benefits for maximum effect. This is the VERY thing that inspires people to invest in themselves through YOU! Strategize how you will show up there, in their hangout, and in such a way they won’t be able to resist working with you! “Find ‘Em” Maximizer 1: JUICY MARKETING STRATEGY WORKSHEETS step-by-step guide designed to help you locate your ideal clients and make a great entrance when you finally meet them – because a first impression really can make or break a relationship! “Find ‘Em” Maximizer 2: 90-DAY MARKETING PLAN GUIDE so you know exactly how to create a plan to get you where you want to go. No more going in circles. You will know WHAT to do WHEN, how and why! “Find ‘Em” Maximizer 3: PUTTING IT ALL TOGETHER MASTERY MANUAL See everything you’ve learned, in action. This 19-page report shows you real-life examples of exactly how other Juicy Grads have successfully put it all together in powerful, results-based marketing materials that get the job done. Examples of business card layouts, websites, marketing brochures, and materials using all of the Juicy Marketing Strategies you developed in the Cash Through Clarity Program. I’ve made it easy-peasy for you to integrate my teachings into your business with these custom worksheets and checklists. In fact, in many cases you’ll be able to take what you wrote on the worksheets and add them to your websites and emails — wouldn’t THAT be a huge time-saver? Learn to design juicy programs and products that multiply your income while serving more people in less time! 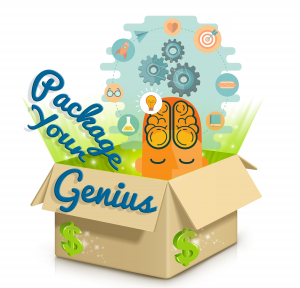 Transform your 1:1 or hourly work into a package or group program! So Kim, this all sounds great but how are you going to teach me how to Claim, Help, Attract and Find my Ideal Clients? Great question! So here are the specifics on how we’re going to do this TOGETHER. 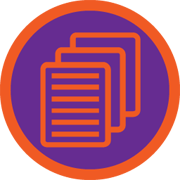 First, you’ll get access to ALL of the Cash Through Clarity Training Modules for a full 3 months so that you can move through the material at your own pace. I'm here to support you with EVERYTHING you are working on each step of the way in our coaching calls. 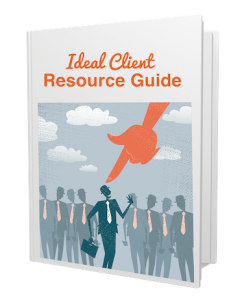 Are you wondering where the heck your ideal clients are? This is THE ultimate resource guide for finding them so you can STOP researching and START getting new clients, now! You will save tons of time (and money) by looking through the guide to discover THE perfect places to show up where your ideal clients are hanging out. This resource contains more than 400+ locations, associations and potential partners to boost your businesses. It’s enhanced to include juicy, laser-focused ideal client categories that I developed from my 15+ years of working with clients to help them find and claim their ideal clients fast! Sounds great Kim! But what’s this going to cost me? Consider it an investment, because it is. It’s an investment in your future. No more wasting money paying for programs that aren’t worthwhile to you. No more financial suffering, because once you put my training to work, you WILL attract your ideal clients. And there’s no question you could make tens of thousands of dollars once you are attracting your Ideal Clients with your personalized Marketing Plan that works for you. My personal clients pay me $8,000 to work through this EXACT same system! For a limited time you’ll only pay $1997, and you also get PERSONAL COACHING 1:1 with me! But the best part is how easy it’s going to be for you to make your investment back. How many private clients will it take for you to make your $1997 back? 3? 2? Or just 1? (If it’s more than that, then you REALLY need this program – we’ll help you raise your rates without losing clients… honest!) I can pretty much guarantee you’ll walk away with the MINIMUM of private clients you need to pay for this program, and probably sooner than you would think. And, let’s take a moment to flip it around. How much does it cost you when you end up compromising and taking those clients you know in your gut aren’t a good fit? Even if they don’t ask for a refund, how much is it costing you in mental energy to try and make them happy? Good News! You are not taking a risk with this investment, because it’s is backed by a complete money-back guarantee if this program doesn’t work for you. I am 100% confident that when you apply what you learn in Cash Through Clarity to your business it will boost your confidence, help you create marketing materials and messages you love and ultimately you will get more clients/customers. Still wondering if Cash Through Clarity™ is right for you? Ask yourself this: Where will I be in three months time? Will you still be struggling with your marketing? Not getting the leads or clients you need to keep your business alive? And the clients you DO get are ones you dread working with? Will you still be in business at all, or will you have closed the doors and crawled back to a “job”? Or, will you invest in yourself now, gain the clarity you must have to underpin all your marketing, and ultimately, change your life? Attract and keep as many clients as you want. Increase your rates because people are desperate to work with you. Work less, and enjoy LIFE more! If you’re been thinking for awhile now you really would like to raise your fees but are nervous or afraid to, Cash Through Clarity is EXACTLY what you’ve been searching for. So are you ready? Take your first step NOW toward making more money, doing what you were meant to do, for people who truly love and appreciate your gifts. YES, KIM! I AM READY TO GAIN CASH THROUGH CLARITY™, TRANSFORM MY BUSINESS, AND FINALLY REALIZE THE SUCCESS I’VE BEEN DREAMING ABOUT! 4 Powerful Training Modules including 10 audio lessons that I can listen to and complete from the comfort of my own home. ($1497 value) I will be developing my marketing and learning at the same time. Multiple Ideal Client Disorder Diagnosis Kit so I will be able to choose focus I feel good about tune my marketing to their frequency. Worksheets, templates and checklists to guide me step by step and makes it super easy to use what I learn right away in my marketing offline & online. Bonus #2 Ideal Client Hangout Resource Guide ($297 value) so I can find out where my ideal clients are and save time and money searching for them. I see the total value with all the bonuses is $3,794. And, I’m completely covered by your Cast Iron Guarantee — If I don’t think this training is worth it after completing all the modules, attending the 5 hours of coaching calls with Kim and asking for support as needed, then I can simply submit my completed worksheets and receive a full refund. P.S. 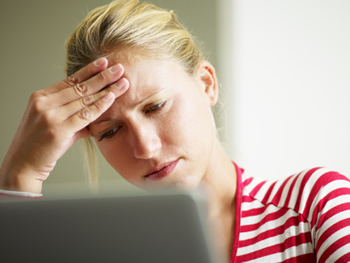 How long are you going to struggle with marketing that’s not working for you? You won’t turn it around without the clarity I’ve been talking about! Q: I’ve tried other marketing programs with little to no success. What makes yours different? A: A few things. First off, because I start where no other marketing program starts — by helping you get clarity! (Without clarity NOTHING works). Second, because this is NOT just another information product. This is a Coaching and Implementation program. I’ve carefully designed it to give you EVERYTHING you need to succeed. You’ll have coaching sessions with me personally to work through your “stuff” and customize what you learn, so it fits YOUR unique business. Q: Will I really be able to find my ideal clients with Cash Through Clarity? Q: I’m a business newbie … I’ve just started my business and therefore have no clients or business experience to reflect back on when it comes to moving forward. Should I wait on Cash Through Clarity until I have more of a foundation? A: Absolutely not. This is perfect timing for you. In fact, by starting out your business based on the principles of Clarity and learning the process we’re going to walk through together, you will save yourself years of struggle, self-doubt, and trial and error. It’s better to start with a focus that you can then refine over time, than to begin in a meandering, general way that wastes your precious resources. This course works for anyone at any point in the life of their business, because it’s about learning a process you can use again and again to get clear, and having the skill and marketing awareness to continue to develop that process as you evolve as a business owner. Q: Why did you decide to include coaching? A: Because I wanted to make sure you walk away with a TRANSFORMATION, not just more information. (Which is the last thing we all need.) You’ll receive coaching with ME. With these Coaching sessions, you’ll have plenty of time and space to get the help you need. Q: What if I have a question or need clarity between the calls and coaching and mastermind sessions? A: You just book a coaching call with Kim. Your 5 hours can be used in any way you like - 15 minute, 30 minute, 1 hour or all 5 hours at a time. Q: I don’t know if I’ll be able to raise my rates. My clients already have trouble with my fees. A: I can’t tell you how many of my clients have said that to me, when in reality what their REAL problem was they didn’t have clarity (on who their ideal clients were or what they offer was), they didn’t have the right words to express what they did which meant they didn’t have the confidence they needed to ask for (and get) higher fees. Q: So what exactly will I walk away with after I’ve completed Cash Through Clarity? Who EXACTLY you should be marketing to — your perfect, ideal clients who you love working with and who love working with you. The words that will effortlessly and easily attract them to you. These words you’ll be able to easily add to all your online and offline marketing materials (website, sales letters, brochures, business cards, etc.) PLUS you’ll be able to use them in your sales conversations, on the stage when making an offer and in network situations. And if that wasn’t enough, all these words will be in YOUR authentic voice, so it will feel natural and authentic to use them in ANY situation. Q: I’m already enrolled in another program designed to help me attract clients. Should I wait until I’m done with that program to begin Cash Through Clarity? A: Actually, the clarity you get when you complete Cash Through Clarity will no doubt supercharge the results you get with your other program! So taking them simultaneously will likely allow you the quantum leap you’re looking for. Why? Because although you’ll learn new techniques and strategies for getting clients, you won’t be clear on your message … so these techniques and strategies won’t pay off as quickly or effectively. Secondly, if you’re not clear on who your ideal clients are, you may build new strategies on the wrong foundation. So clarity really is essential when it comes to attracting ideal clients (the ones you’ll love working with! ).